O programa de recompensas Hilton Honors está fazendo uma boa promoção em que é possível ganhar 2 mil Avios por hospedagem em hotéis da rede, limitados a 10 mil Avios por 5 estadias. Para participar, é necessário o registro prévio no hotsite. This promotion is open to eligible participants. An eligible participant is a person aged 18 or over and is a British Airways Executive Club Member (membership term and conditions apply). 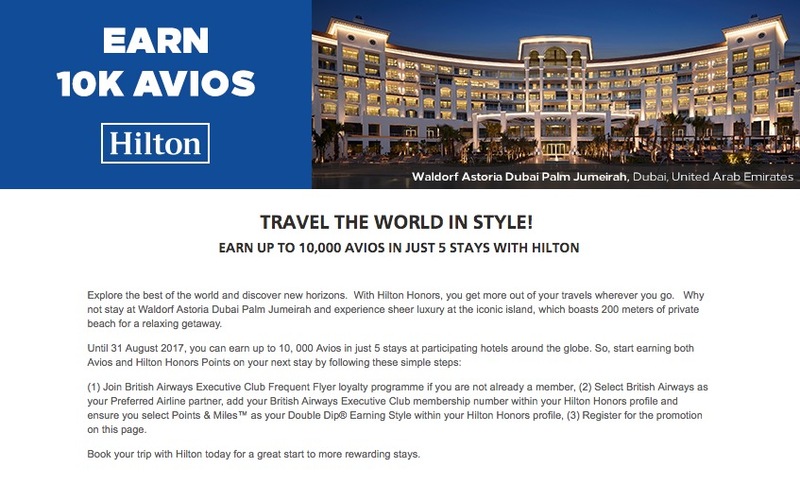 To be eligible for this offer, you must be (1) be a member of Hilton Honors; (2) select British Airways Executive Club as your preferred Double Dip® Earning Style within your Hilton Honors profile; (3) register online at Honors.com/BAQ22017, prior to completing your stay; and (4) compete an eligible stay at any participating hotel or resort within the Hilton portfolio from May 15, 2017 through August 31, 2017 (promotional period). Bonus Mileage: 2000 Avios on first stay; 2000 Avios on 2nd stay; 2000 Avios on 3rd stay; 2000 Avios on 4th stay; and 2000 Avios on 5th stay. A ‘stay’ is defined as the total number of consecutive nights spent at the same hotel, whether or not a guest checks out and checks back in again. Specifically excluded from the definition of ‘stay’ are the following types of ineligible stays: wholesale/tour operator packages; contracted crew rates; travel agency discount rates; stays secured utilising Hilton Grand Vacations Club, and Hilton Club timeshare programs; Hilton Grand Vacations marketing packages with a sales presentation requirement, complimentary or barter rooms; NET Group rates, Series Group or IT Group rates; third party websites bookings (irrespective of rate paid); and ‘opaque’ channel bookings where the brand may or may not be known at the time of purchase. Hilton Honors Points (or stay credit) may not be earned (including as a Member benefit) for or during ineligible stays, including without limitation, folio charges incurred during ineligible stays. Allow up to six weeks after check-out, and after promotion has ended, for miles to be credited to your account. All British Airways Executive Club program rules apply. Hilton Honors™ membership, earning of Points and Miles™ and redemption of points are subject to Hilton Honors Terms and Conditions. Award miles are issued subject to the British Airways Terms and Conditions. The promoter reserves the right to withdraw the promotion or amend these terms and conditions without prior notice at any time, for whatever reason and without any liability to customers for doing so. Promoção muito boa para maximizar o acúmulo de Avios. Vale registrar que essa promoção é cumulativa com a promoção vigente de pontos HH em dobro (post aqui).